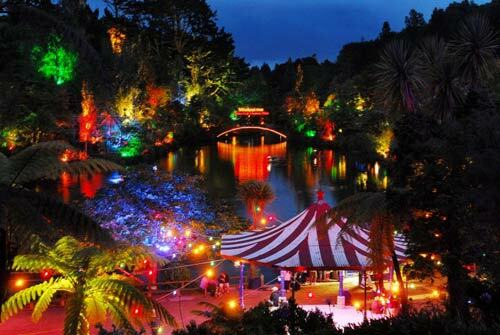 During balmy summer evenings from mid-December to early February, Pukekura Park in central New Plymouth is transformed with an array of coloured lights. There is also a nightly programme of performance and music amid the lakes and lawns. Established in 1993, the Festival of Lights had its origin in the multicoloured 15-metre jets of the fountain in the park’s lower lake. It was installed in 1955 to celebrate the visit of Queen Elizabeth II and the Duke of Edinburgh the previous year.